Brace yourselves. Only this blog will be completely transparent to you and show you how an accident, human error or faulty design in cycling can hamper your health and put you in serious danger, sometimes even resulting in death. This one culminated in a loss of life. Sadly. This story comes to you thanks to an email to me a couple of days back from a reader in Taiwan. The victim was a 72 year old rider. He was riding with four of his friends on a local road in Taiwan on 2/28/2009. The section of that road was a gentle downhill, and not much wide with little traffic. The bike was a BMC road model ( I don't recognize it. An SL01 Racer?). So it seems no one really observed what happened. The rider in question may have strayed away from the group by dashing out in front, but from the fact that we know his age, I hinge on the assumption that he may have been left behind by the group. Now, there was an impact. With what, how and why, no one knows for sure. Though the victim wore a helmet, his face hit the tarmac and his chest was struck by the stem. Later in hospital, he breathed his last. Trusting that the information given to me is true, below is the scene of the crash. 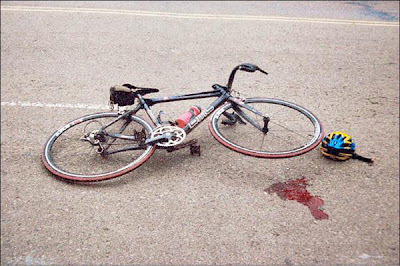 The blood on the road is likely to be the cyclist's. Notice carefully that the chain appears to be jammed. On the front side, the chain appears to have slipped from the big chainring. On the rear, it is tangled onto the derailleur and the latter is also in a very atypical/extreme position. What may have happened was the derailleur and chain jammed, stopping the rear wheel at once and throwing the rider off his bike. This comes from primary observations. Did something get stuck in his derailleur causing this? Was the chain too short such that when the chain was shifted onto the biggest sprocket in the rear (combined with big chainring in front), the derailleur ran out of travel and the entire setup jammed? Could it have been that in this situation, the rider went into panic mode and somehow made up his mind that gripping both brakes as hard as he can to stop the bike would be the solution and that eventually caused the crash? It is also not known whether there was an obstruction in the road, an animal that came in the way or the probability of a hit-and-run case from a reckless motorist. Put on your thinking caps here and lets do a brainstorm. We will try and come to a reasonable conclusion about what exactly happened and also how it could be avoided. That this cyclist eventually died should ring some alarms in everyone's mind who comes across this story. While its very likely that this crash put some serious injuries to him, I would also be interested in knowing this man's medical history. Phil : Yes, he was pushing his 70's. But his previous medical condition doesn't interest me right now. I'm looking more at the series of events that led to the crash so it can be AVOIDED by someone reading the story. I think that his age and his medical history would be pertinent to the crash. We need the exact doctor's diagnosis on the cause of death. If the chain slipped off the front ring wouldn't that release the tension on the freewheel and you'd just coast? 6. Suddenly there is alot of tension on the upper length of the chain as he continues to peddle which causes the chain to slip off the front ring. 7. Just as sudden there is no tension on the crank arm - it induces a tripping like motion. The inertia propels him forward so chest hits the stem and he falls off. Upon closer look it seems the lower pulley seems to have rotated clockwise so that it is the one behind the deraileur. Since there is no longer any tension on the upper pulley the chain becomes slack and loops off but the attitude of the upper pulley feeds the chain to an outer cog whereas it is being pulled back to the crank on one of the larger inner cogs. The rpm of the smaller outer cog is faster than the rpm of the larger inner cog so the chain buckles and gets jammed. I still think it starts with a malfunction of the spring and ends with inertia throwing him on the stem and then to the ground. It looks to me that the chain has broken. That could cause a crash. 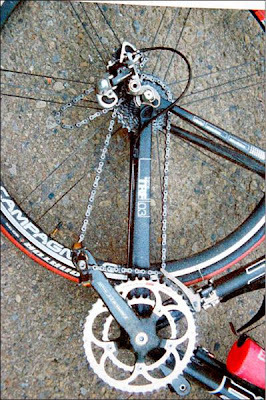 I had a similar crash 30 years ago, I hit a bump and my chain bounced off the freewheel and into the spokes, instantly locking my rear wheel. Fortunately I was not going fast. It also wreched my derailleur by pulling it right back. I'd go with the chain somehow jumping off the big ring, losing tension, then somehow jamming the rear. Possible with a violent enough crash - bike flipping over and over - have chain come off like this? If that was the case, the bike would show other damage as well - which I guess is not the case. Either way - freak deal. Too bad for the rider, not a pleasant outcome for all involved. 72 years and still riding is nothing short of commendable. I wish the friends and family of this man my sincere condolences. Without an eye witness account and/or more evidence, e.g., photos of any skid marks on the road, flat spotting on the rear tire, etc.. it's impossible to know what happened and whether or not the drive train ended up looking the way it does before or as a result of the crash. I'm with Atlanta Mark -- there's no way to tell if the chain ended up that way after the crash. Condolences to the cyclist's family and friends -- I hope to still be on bike at 72 years old.